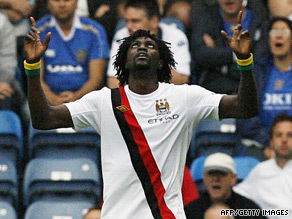 Big-spending Manchester City continued their perfect start to the English Premier League season on Sunday, winning 1-0 at struggling Portsmouth thanks to Emmanuel Adebayor’s third goal in as many games. The Togo international, who also scored the only goal in last week’s win over Wolves, netted in the 30th minute to pay off another slice of the reported $41 million City paid to buy from Arsenal in the summer. The result lifted City into the top four — their stated end-of-season goal following the takeover by the Abu Dhabi United Group a year ago — level on nine points with local rivals Manchester United and three behind Chelsea and Tottenham, who have all played one more match. The match was watched by new Portsmouth owner Sulaiman Al Fahim, who fronted the consortium that bought City before Sheikh Mansour Bin Zayed Al Nahyan came forward as the main man. While City have splashed the clash in revamping manager Mark Hughes’ squad, with latest signing Joleon Lescott making his debut at Fratton Park, the home side have been hampered in the transfer market as Al Fahim’s takeover dragged on. It was finally completed last week, heading off a failed rival bid from the club’s chief executive Peter Storrie, and manager Paul Hart moved quickly to bring in Watford striker Tommy Smith and Wigan midfielder Michael Brown. Both made their debuts against City, but new loan signings Jamie O’Hara and Kevin Prince Boateng of Tottenham were not registered in time as Portsmouth suffered a fourth successive defeat. Hughes opted to start with Brazil star Robinho on the bench, meaning Craig Bellamy started up front with Adebayor. Portsmouth, who have lost key players Peter Crouch, Jermain Defoe, Glen Johnson and Sylvain Distin this summer, made a bright start but City soon got into their stride. Carlos Tevez fired wide from a free-kick and goalkeeper Asmir Begovic, starting in the place of injured England international David James, needed to recover quickly after fumbling from another set-piece. City’s winner came from a corner as Adebayor left his marker Aaron Mokoena and headed in Gareth Barry’s inswinging delivery from close range. Micah Richards thought he had made it 2-0 but his effort was ruled out for offside, while Brown had the ball in the City net but it was chalked off for handball as he charged down a clearance. Portsmouth’s best opportunity fell to substitute David Nugent in the closing minutes, but the striker’s weak close-range shot was instinctively blocked by goalkeeper Shay Given. City won only two away games last season, but have now matched that total already. Aston Villa bounced back from midweek European heartache by beating fellow Europa League entrants Fulham. The visitors made the worst possible start when Ghana defender John Pantsil headed into his own net in the third minute under pressure from Gabriel Agbonlahor. The young England international striker wrapped up victory after an hour with his first goal of the season as the Fulham defense retreated, allowing him to lash home with his left foot. Everton, who like Fulham progressed to the group stages of Europe’s second-tier competition on Thursday, registered their first points this season with a last-gasp 2-1 win at home to Wigan. Leighton Baines netted a penalty in the third minute of injury-time after Emmerson Boyce fouled striker Jo, with Louis Saha having canceled out Paul Scharner’s opener for Wigan. Austrian Scharner broke the deadlock in the 57th minute as he headed home Charles N’Zogbia’s right-wing cross, then Jordi Gomez hit Everton’s woodwork, but French forward Saha leveled on 62 when he nodded in a Baines corner.